Apartment Buller is an exclusive new apartment for 4 to 6 people, only 80 meters from the beach. The apartment is located on the beach promenade between Vodice and Srima and was completed in late 2005. 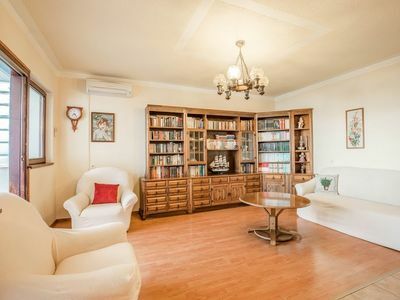 Apartment Buller is located on the beach promenade between Vodice and Srima. In the immediate vicinity there are several beaches with sun loungers. The beaches are very clean and well geeiget for children. The beaches are here, as almost everywhere in Croatia from pebbles. Srima and Vodice received the award for several years the Blue Flag for its crystal clear and clean sea water. Beaches and surrounding areas: The beaches are very clean and well suited for children. Throughout Croatia slippers are recommended, you can buy in shops along the beach promenade everywhere. Just 80 meters from the apartment is a small recreational boat harbor, beach and beach bar. There are several restaurants in the vicinity. In recent years, the locations of Vodice Srima more and more grown together. Strolling along the beach to get past the first lively marina - then waits the idyllic old town of Vodice with its inviting restaurants, cafes and shops. 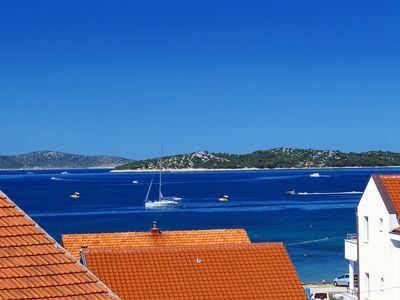 Vodice is particularly known for its numerous activities, arrangements and concerts. Vodice has a picturesque old town, marina, many restaurants and the suburbs located a large nightclub. Along the beach promenade you can motor boats, water scooters and pedal boats. Water slides and trampolines are very popular with children. Climate: Kroatia has a typical Mediterranean climate. The summer along the Adriatic coast is warm with little rain, the winter is mild. In summer, temperatures between 19 ° C at night and during the day 30 ° C. The sea water is very clear and clean - for Croatia is known. Water temperature about 23 ° C. The best time to visit Croatia is from May to September. July and August are peak season. At Easter, the temperatures are very pleasant and in Vodice are on the occasion of the holidays many activities. Excursions: The area around Srima Vodice and is called by a tour operator as the 'natural pearl of Croatia'. Not without reason: For day trips you can experience the breathtaking national parks close - dive in the crystal clear water at the Krka waterfalls. There are so few picturesque old towns along the coast of Croatia, but hardly one that can compete with Trogir. Its medieval atmosphere, the Venetian courts and the luxurious yacht harbor on the promenade attracts visitors in its spell. The Kornati Islands are a unique labyrinth of sea passages, small islands and reefs off the Dalmatian coast. Are set in a 35 km long and 13 km wide area scattered 147 small islands and reefs, the largest and densest archipelago in the Adriatic. The Kornati islands are like a separate universe from predominantly bare rock peaks towering above the sea. A wonderfully bizarre, maritime karst landscape.